Watchable romantic drama, enlivened by strong, likeable performances from its two leads, but the plot falters considerably in the second half and the climax is ultimately disappointing. 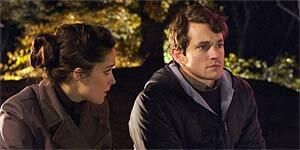 Written and directed by Max Mayer (a New York theatre director and playwright), Adam stars Rose Byrne as New York writer Beth, who moves into her new apartment and is keen to get to know her attractive but quirky neighbour Adam (Hugh Dancy), who appears to lack a few essential social skills. As they begin a tentative relationship, things suddenly fall into place when Adam tells her he has Asperger's Syndrome and the pair have to negotiate the various emotional pitfalls that ensue. Meanwhile, Beth's smooth-talking father (Peter Gallagher) reveals he's being investigated for fraud, much to the consternation of both Beth and her mother (Amy Irving). Hugh Dancy is an extremely likeable actor and he delivers an impressive performance as Adam, even if the script drops the ball a few times on the reality of the Asperger's Syndrome (particularly in the area of physical contact). He's ably supported by Rose Byrne, who clearly relished the opportunity to play a slightly more cheerful character than the miserable sods she usually gets lumbered with. Fortunately, there's just enough chemistry between Dancy and Byrne to ensure that this doesn’t become a chore to watch. There's also strong support from Amy Irving, Frankie Faison (as Adam's lone friend and confidant) and the always-excellent Peter Gallagher. The problem is that the film runs out of steam at the halfway point – once the characters get together, the script completely runs out of ideas and the second half of the film feels contrived and forced as a result. Similarly, the finale is disappointing and doesn't even make emotional sense – the book dedication scene, for example, seems oddly misplaced, as if it was left over from a previous version of the script. In short, Adam remains watchable thanks to credible performances from its two leads, but it fails to satisfy on an emotional level and could have been a lot better.